SAO VICENTE, BRAZIL, FEBRUARY 19, 2014 – When TV Tribuna was looking to enhance its mobile broadcasting capabilities, the Brazilian affiliate of Rede Globo turned to Integrated Microwave Technologies, LLC (IMT), a Business Unit within the Vitec Group’s Videocom Division, and a leader in advanced digital microwave systems serving the Broadcast and Sports & Entertainment and markets. TV Tribuna, worked with Videodata, a leading Brazilian systems integrator and equipment supplier, to outfit its smaller sized vehicles, such as motorcycles, with IMT’s Nucomm CPTx-II Compact Portable Transmitters), enabling the station to broadcast from remote and harder to reach locations. TV Tribuna also added RF Central VClip microLite HD Transmitters (VMLT) to its ENG gear in order to give its reporters the flexibility and mobility needed to more thoroughly cover local sporting events. TV Tribuna becomes the first Brazilian broadcaster to purchase and deploy IMT’s Nucomm CPTx-II. As a result, TV Tribuna’s improved mobile capabilities gives the station a competitive advantage in the Brazilian broadcast market, as it can now provide TV Tribuna’s viewers with unprecedented on-location coverage. The durability and small form factor of the CPTx-II allows TV Tribuna to access and cover stories that traditional ENG trucks cannot access by employing this technology on its motorcycle and small production vehicles. 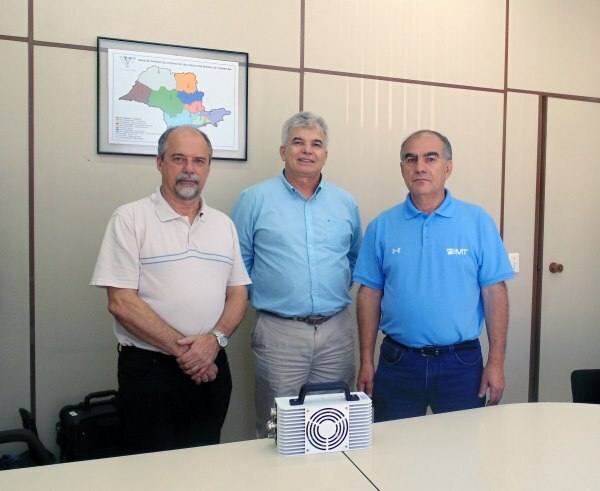 In addition, the station also incorporated IMT’s RF Central VClip microLite into its arsenal of gear, which will be used in TV Tribuna’s coverage of the Santos Futebol Clube games as well as other local sporting events. IMT’s microLite gives the station the ability run freely throughout the stadium and not be tied down by cable runs. IMT’s microLite has also given TV Tribuna the ability to conduct locker room interviews of the players and coaches. The CPTx-II supports video/audio/data/telemetry with selectable modulation bandwidths of 6, 7, and 8MHz. In addition to the small size, the unit has very low latency and a low power consumption. It weighs about 3 kg and comes with a variety of mounts, including special mounts for motorcycles. The maneuverability of a motorcycle fitted with video transmission capability offers significant advantages as the camera can get onto roads and into locations that might be too narrow for a traditional vehicle to navigate safely. The RF Central VClip microLite HD Transmitter (VMLT) is a new addition to IMT’s award-winning RF Central family of microLite HD products. The VMLT is a compact wireless camera video transmitter that mounts on the end of the cameras between a plate and any V-mount battery, a widely used mounting option for the industry’s leading professional cameras. The V-mount option is integrated on both sides of the VMLT transmitter, allowing the transmitter to be mounted to the camera, then the battery to be mounted to the transmitter. As a result, the battery can be used to power up the transmitter and pass power through to the camera. With its compact, clamshell design, the VMLT is ideal for a variety of mobile applications, including live sports events, reality TV productions, ENG/OB broadcast and video assist. Videodata is a leading Brazilian systems integrator and equipment supplier for the TV Broadcast, Pay TV, Telecommunications, Internet and Government markets, with 20 years of experience. Carrying a roster of respected and industry-leading broadcast manufacturer partners, Videodata has a complete portfolio of products and services including Playout Servers and Automation with hundreds of playlists in operation, Video Compress & Satellite HD Microwave Links, Production Equipment, 3D On Air Graphics, Media Asset Management, Archiving Solutions. Videodata has pioneered and launched several key technologies and innovations in Brazil, including media asset management and archiving, MPEG-4 video transmission, broadcast video servers, virtual sets, TV automation with servers, and most recently mobile HD transmitters for helicopters and OB vans. More information is available at http://www.videodata.com.br. Vitec is an international Group principally serving customers in the Broadcast & Video, Photographic and Military, Aerospace and Government (MAG) markets. Listed on the London Stock Exchange with 2012 revenue of £345.3 million, Vitec is based on strong, well known, premium brands on which its customers worldwide rely. Vitec is organised in three Divisions: Videocom, Imaging and Services. Imaging designs, manufactures and distributes equipment and accessories for photography and video. Services provides equipment rental, workflow design and technical support to TV production teams and film crews.